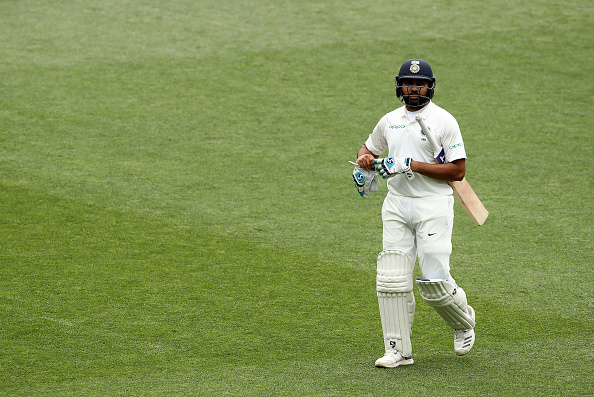 Rohit Sharma scored only 37 runs in Adelaide Test. 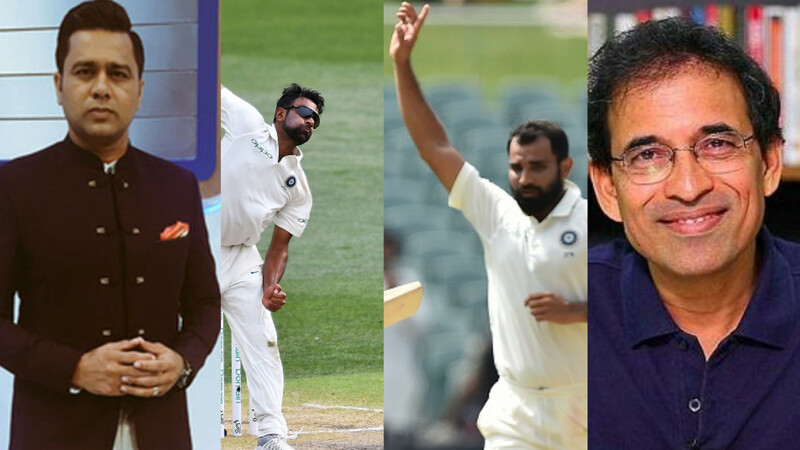 Mumbai Indians' (MI) social media post concerning Rohit Sharma’s batting in the ongoing Adelaide Test did not really go down well with fans Sunday (December 9). 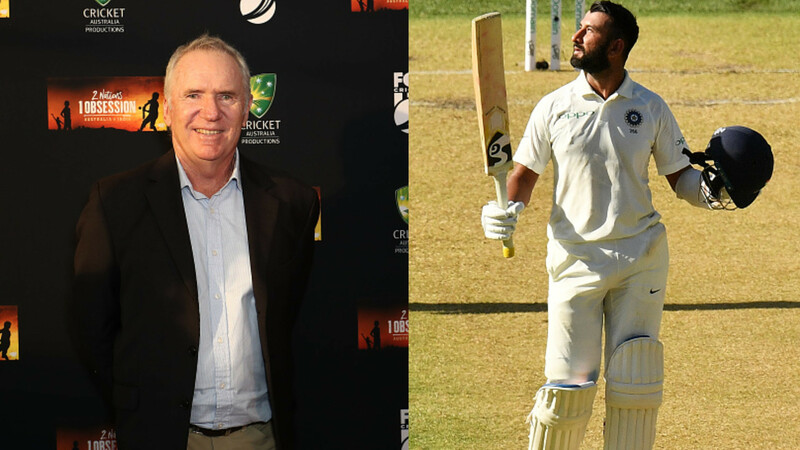 The Indian batsman got the life-line to revive his Test career on the back of his string of brilliant performances in the white-ball cricket for the ongoing four-match Australia Test series. However, the MI skipper made a good start of his Australia Test campaign by playing a 37-run knock in the first innings, but few rash shots prevented him from building up his brilliant start to impress the fans and national selectors and got dismissed with the scores in the first innings. Meanwhile, Mumbai Indian went on their official Twitter handle on Sunday to ask the fans to retweet it if they woke up to watch Rohit bat in Adelaide, but his miserable run in the longest format of the game continued in the second innings as well against Australia. After the fall of Cheteshwar Pujara’s wicket, Rohit came out to bat and he just needed to give support to Ajinkya Rahane, as India were already at the good position, but the batsman failed to do so, departed for just 1, and then the IPL franchise quickly deleted the tweet. Their captain’s another cheap wicket in the Test cricket left the MI red-faced as the cricket fans already took screenshots of their tweet before deleting to troll the franchise on Twitter.
" Woken up to watch Rohit Sharma bat"
Mi self troll baadshahs ???????? Hahahahaha. 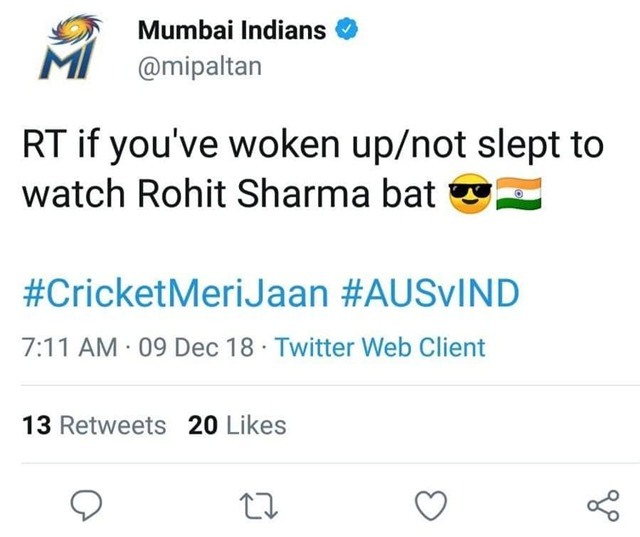 @mipaltan actually tweeted this, Rohit came out & walked back and they deleted? See the confidence of @mipaltan . Their tweet also lasted as long as rohit's innings.. This is called self troll! ???? And back in the pavilion soon after ??? ?